Makes up to 4 servings Start to finish 20 minutes We love this salad, this recipe is not just low fat and extremely healthy, giving your body the nutrients it needs. You can always substitute vegetables or add more berries. Finish with HEPP'S Applewood or Hickory smoked salt just a pinch, it will bring out amazing flavors in the tomatoes, kale and fruit. Also substitute HEPP'S garlic salt in the dressing instead of the garlic powder. Always look for as many natural substitutes when cooking to avoid the added preservative, and chemicals. 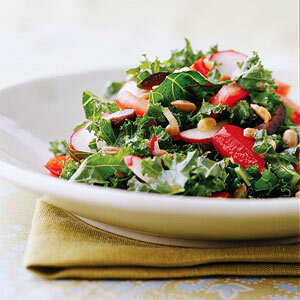 In a large bowl, combine kale, tomato, sweet pepper, olives, radishes, green onions, and sunflower kernels. Toss gently to mix. Drizzle Asian Dressing over vegetables. Toss gently to coat. Makes 4 (1-cup) side-dish servings. Asian Dressing: In a screw-top jar, combine lemon juice, water, reduced-sodium soy sauce, olive oil, onion powder, and garlic powder. Cover and shake well. Chill until ready to serve or for up to 1 week. Makes 1/2 cup.